This week I'm busy doing DCC conversions, I needed to rest a little bit of track laying. Mangattan Liner was running without the cab and end cars, so it's time to complete the DCC conversion of this train. In this case I decided to use a Digitrax DZ123 decoder. It makes a little bit more complicated the conversion because I have only two outputs (and I want to lit three lights: front, rear and interior lighting), and also because this decoder is not polarity switching capable. If it had the last thing, I wouldn't need to modify the led board. 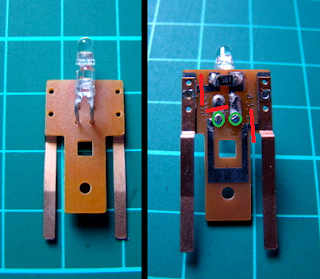 First you have to unsolder the rear led (see the green circles in the photo) and turn it bending the legs in the opposite direction. In the original board the positive leg of one led is soldered together with the negative leg of the other. But I'm not using a switching polarity decoder capable, and the common wire in Digitrax decoders is positive. That's why I turn the rear led, in this way the positive legs of both leds will be soldered together with the resistor. And last, I do three cuts in the tin tracks to aisle the negative legs of both leds and the current pickup (see the place where to practice the cuts in red). On the other side, I'm preparing also the led strip. My idea is to connect decoder outputs first to the led strip, and from here derive the needed cables to the led board for the front and rear lights. As there are only two outputs, and none of them is always active (they are directional), I'll connect both white and yellow outputs to the led strip protecting them with two standard 1M4148 diodes. CAUTION: In the photo above I forgot to add also a resistor in the positive wire, it's solved in the following photos!! My previous error forgetting the resistor makes me remind you to test each step of the conversion. Use your tester to check continuity in the cuts and be sure they are well done before soldering, and connect decoder to the track like in the following photo to test each conversion step, light intensity, .... never forgot to test and check everything twice!!! Do not solder or fix something before being sure it works perfect. Enjoy your Mangattan Liner II!!!! !